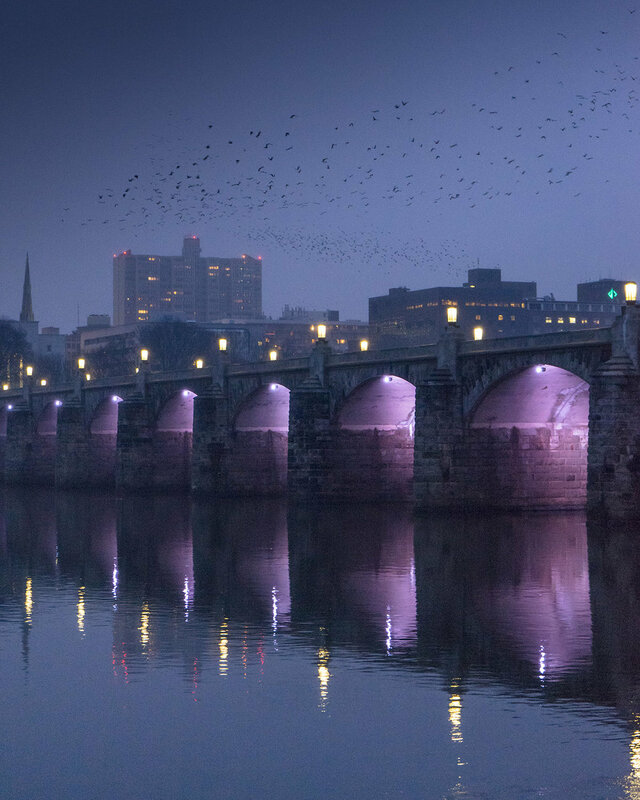 I am no stranger to the clamorous crows that frequent Harrisburg in the winter months of the year, but I have never seen this many crows, this close, ever. Hell, I have never seen this many birds together at once, period. I don’t even want to venture with a number, but they were plentiful. If you’re on a desktop, be sure to click on each image to get a better look at their numbers. When we first parked we took notice to the large numbers of crows perched on the string of trees that lined the island’s western shores. Being that I only had a 28-70 with me, and plenty of things to shoot right in front of me, I chose not to walk over and investigate them. But just as we were beginning to leave, the sound of 1000 crows flying filtered through the fog laden atmosphere. 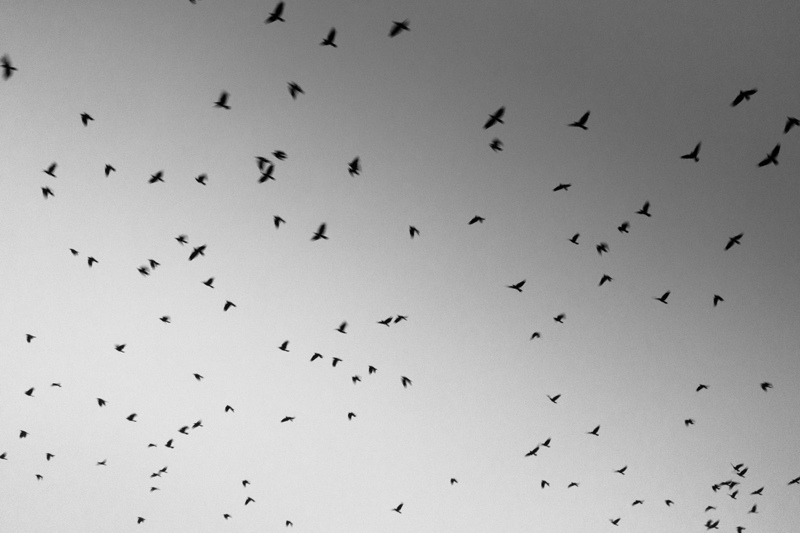 Something had spooked them and they began to leave the trees in waves of flickering black dots. 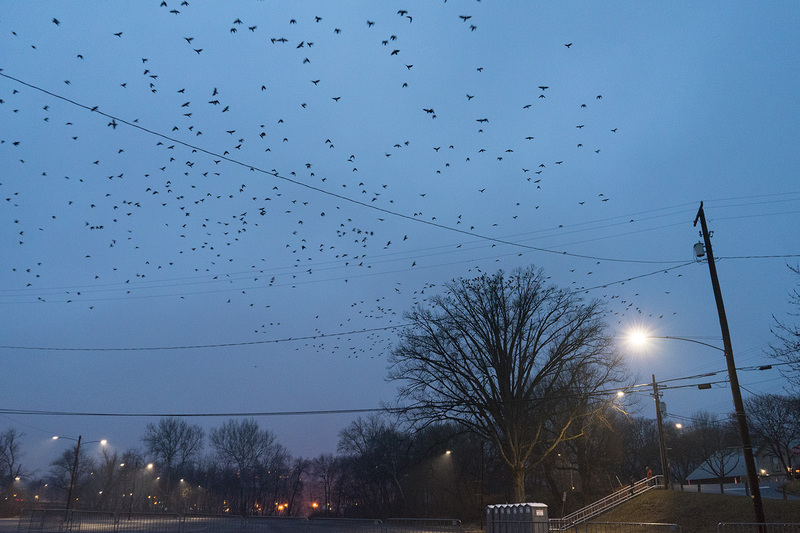 Since I had a few moments to set my camera settings before the crows entered my range, I made a snap judgement and decided to go with a slower shutter speed to try and accent their crows’ erratic movements. See the picture above for reference. After a couple shots at slower shutter speeds, I decided to speed it up a bit to capture a bit more detail of the crows without losing the movement. Luckily they decided to circle the island, landing quickly in trees and taking flight again just as fast. 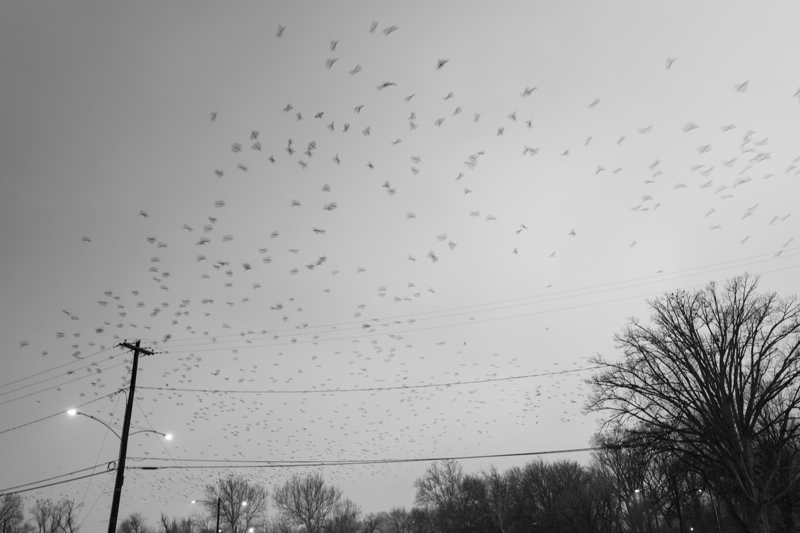 To my eyes they resembled bats more than crows, or at least that is what my brain could equate it with. Like I said, I have never seen this many birds in one place at one time ever. After circling for a few minutes, they decided to leave the island and head towards the heart of the city. They streamed across the river in a black line that spanned the entire distance between the island and the city. Previously while the birds were circling, I mentioned to my brother how dope it would be if they would head into the city, and now they were! I snapped rapidly, as rapidly as I could while being mindful of camera shake, after all I was shooting all of this handheld in low light. I debated about sharing the two versions of the shots above, as I know I need to be more selective with the photography that I share, but I really dig each of the frames. I suppose to rationalize my tendency to over share images that are similar to one another, I shall say that my blog has aspects of contact sheets. Eh. 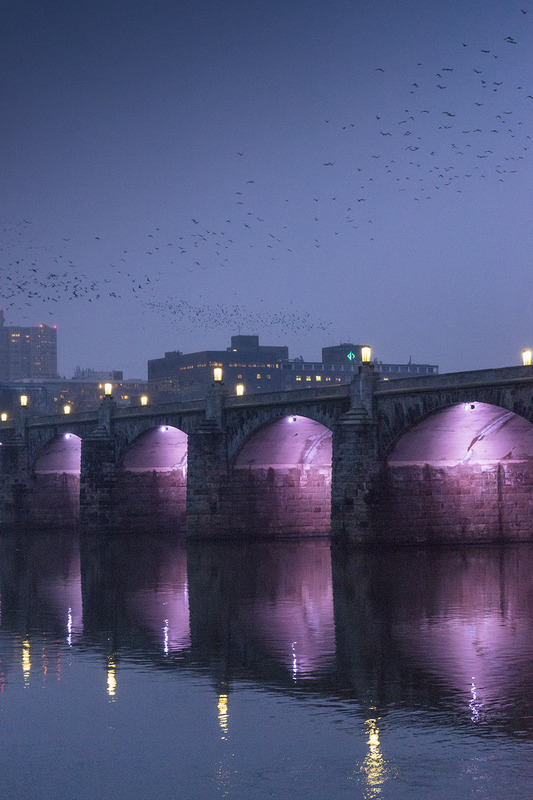 Regardless, I like the crows better in the first photo and the framing of the city better in second one. I guess nothing is perfect. Or maybe I just need to keep shooting.